Police are investigating an incident in which a Stevenage player was punched by a fan in the aftermath of the club's shock 3-1 FA Cup win over Newcastle. Defender Scott Laird was knocked to the ground after the final whistle as the League Two side celebrated their win. 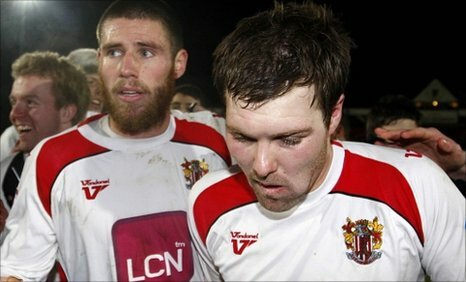 A Hertfordshire Police spokesman said: "It is believed a Stevenage fan assaulted a Stevenage player." Police have described the fan as a white male wearing a white Diesel top and red and white Stevenage scarf. The Football Association has also confirmed it will be looking into the matter. "The FA will be investigating the incident and seeking to establish facts from both clubs and the police," said a spokesman. Videos of the incident, which was captured by match broadcaster ESPN's cameras, were immediately circulated on the internet. Stevenage manager Graham Westley was disappointed that the club's most famous victory had ended in such a manner. "Scott Laird was stood celebrating with the fans and a fan just came over and smashed him from the side," said Westley. "He went to the ground and it is a shame for the afternoon to end in that way. "He is a bit bewildered. He [the fan] gave him a right-hander, just smashed him across the cheek and knocked him to the ground."